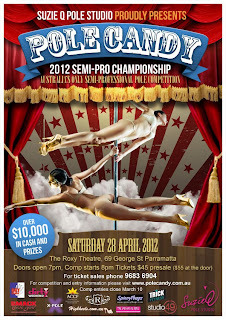 The 2012 Pole Candy Semi Pro Championship final is next Saturday! and for me, this weekend is full of final preparations!! So far today I've finished adding some sparkles to my costume that I had made by the fabulous Georgia at Georgia Moon and painted to coats of paint on to my prop :) Now all that's left to do is a few extra touch ups on the prop and add some velcro onto another part of my costume... ohh and then theres the routine!! I've choreographed it, but I actually haven't had a chance to run through it properly yet, because my shoulder's been a bit out of sorts for the last week (boooo). Tomorrow will be routine day and hopefully I'll be able to fit in some more practice on Wednesday before the final on Saturday. I'm actually not feeling to nervous at the moment, usually about a week or two before a comp I'm as nervous as hell and panicking. I feel oddly calm and relaxed which can only be a good thing, right? So You Think You Can Fall Off a Pole. As pole dancers we all fear at some stage that we're going to have a massive stack off the pole right?? 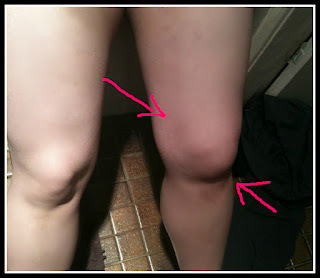 For me that moment came true, and not only did I have a massive fall I had a massive fall on stage during a competition. It was the first Pole Candy Semi Pro Competition run by Suzie Q Pole Studio, and let me tell you I was pretty nervous, actually probably the most nervous I've ever been before a comp. Anyway I was half way through my routine when I was coming out of this move (i'm not sure what it's called or even if it has a name), but here is a photo of Felix doing it (cause I don't have a nice one of me). As I was coming out of it my top had slipped off the pole and I fell, face first, and hit the floor. I was about a metre up the pole at the time so as you can imagine it was a pretty scary moment, not just for me but for everyone who was there watching. So you may be wondering why? Why choose a stage/pole name? What's wrong with the name my parents gave me? Well there's nothing wrong with my name, it's okay i guess, obviously not what I would have chosen for myself but hey, who out there is really happy with the name they were given by their parents? A lot of the girls in the pole world use a stage name, and some for different reasons. For me it was mainly because I thought my name was boring, but the more I think about it the more i realise how much it makes sense for me to separate the everyday me from the pole me, and probably not for the reasons your thinking.